It’s time to rethink the teacher dress code. If you had walked in my classroom 12, or even eight, years ago, you would have seen me up front most of the time. My students sat in straight rows while I was lecturing or leading a class discussion of a text. I probably would have been wearing a pencil skirt and high heels, my hair in a tight bun at the base of my neck. I was young and trying desperately to separate myself from the 16-year-olds I was trying to teach. But walk into my classroom now, and you’ll see something entirely different. Tables in groups, students on the floor with Chromebooks in their laps. Me sitting criss-cross (applesauce) with one group or kneeling down to help another. The students are talking, collaborating, moving around. That pencil skirt? Donated years ago, as skinny jeans (in multiple colors) started to fill my closet. 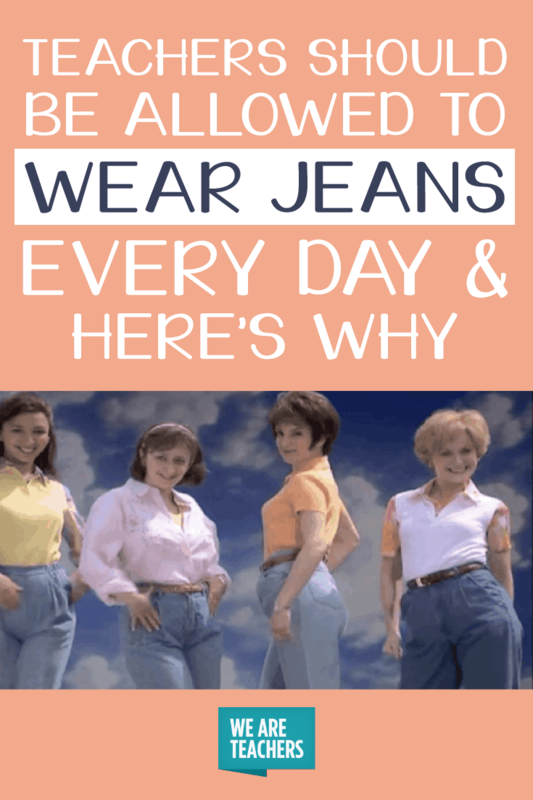 There is a lot of controversy around whether or not teachers should be allowed to wear jeans, but I think jeans should be a part of the teacher dress code, and here’s why. 1. Jeans say I’m dressed to work, not just for work. It’s hard to sit down on the carpet and read a book with your kids while you’re wearing a skirt. You constantly have to check to make sure everything is covered. I can’t lean over a desk to help a student in a classroom full of teenagers if I’m concerned about where my skirt ends up when I’m bent over. I also don’t want to worry about creasing my dry-clean-only dress pants (who has time or money for dry cleaning?). Jeans solve these problems. No fear of embarrassing pictures on Snapchat or a spam Instagram account or expensive dry cleaning bills. Plus, I can work in jeans: I can move, sit, stand, or kneel without worry. 2. Jeans allow you to blend in while walking in the hallways. I look pretty young (according to my students). I also carry a backpack because it’s way better on my back and I am out of my classroom for over half of the day. So when I’m trudging through the halls in my jeans and backpack, the kids don’t even notice I’m there. Imagine all of the inside information I learn during these adventures! The best is when a kid in front of me cusses and I say “language!” They turn to retaliate, realize I’m a teacher, and say, “Sorry, ma’am.” Or when a kid waves to me, and their friend asks who I am, and the kid replies, “My English teacher.” Constant entertainment. 3. Wearing jeans helps build relationships. What is the key to being an excellent teacher? Great relationships with your students. Dress clothes say I am your boss, but jeans say I’m with you. In my classroom, I am a facilitator, a coach, and a mentor. Jeans allow me to fill those roles more easily (and comfortably). 4. Teachers who wear jeans are happier. “Happy wife, happy life” is a saying we often hear when someone gets married. Well, the same goes for the classroom. “Happy teacher, happy class” seems like a good saying. After all, the teacher’s mood usually sets the tone for the day. When you’re comfortable, you’re happy. When you’re happy, you’re a better teacher. And when you’re a better teacher, your students learn more. Who isn’t happy when they’re wearing their favorite pair of comfy jeans? 5. Jeans allow teachers to be more mobile and hands-on. Teachers today don’t just stand up in front and lecture anymore. Being comfortable means being able to move, to bend down to help students, or to sit on the floor to help a kid organize their backpack full of papers. Jeans help teachers do their jobs at the highest possible level. I work in a school where the teacher dress code is not strictly enforced. Teachers wear jeans pretty regularly, but we don’t look like a slovenly group of people, nor are our students suffering because of our casual attire. Most of the arguments against wearing jeans claim that if teachers want to be treated like professionals, they should look like professionals, but I’d argue that there is no longer a blanket look for professionals. What’s your take? Should jeans be a part of the teacher dress code? Why or why not? Come and share in our WeAreTeachers Chat group on Facebook. Plus, 25 Teacher Wardrobe Staples You Can Buy on Amazon for $25 or less. Hi, My name is Tara Kegley. I have taught high school math for28 years. I 100% agree with you on the comfort and functionality of wearing jeans. For me, it’s mainly a matter of shoes. I am so much more comfortable in tennis shoes or boots.